1 Blackout: what are challenges, merits, tiers and echelons? Challenges in Call of Duty: Black Ops 4 award you with XP and merits, depending on your play mode. For Blackout mode the rewards are merits, which help you level up. Here’s how they work and a list of all the Challenges you should be working towards if you want to reach the highest level of play. If you’re looking for more guides to Blackout, we have a full list of perks, a map of all helicopter spawn locations and where to find zombies and the loot they spawn. Blackout: what are challenges, merits, tiers and echelons? 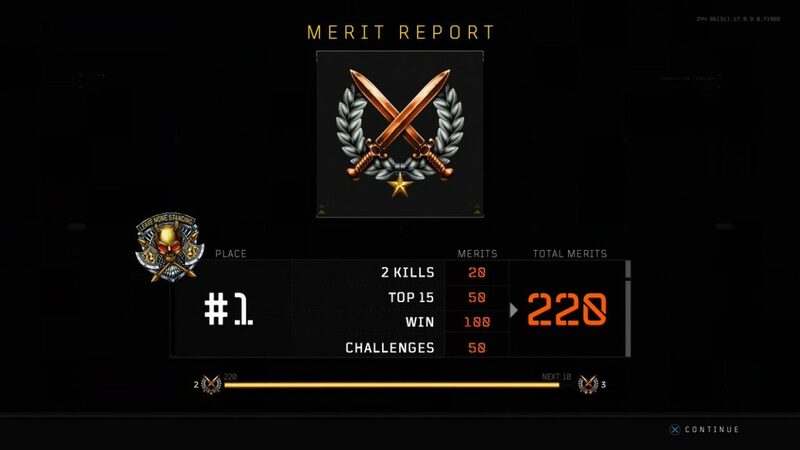 Blackout Challenges are split into two sets of two. Career Challenges include Professional Challenges and Survivalist Challenges. Operations Challenges are split into Heroics and Vehicular. There are also Dark Ops Challenges – these are classified and are revealed as you play. We’ll come back to those further down the page. The majority of these challenges have three tiers to complete, with each tier handing out extra Merits once completed. For example, the Winner Winner Challenge hands you 50 Merits for winning a match in solo. Complete that Challenge 10 times and you’ll also Complete Tier 1, which hands you a bonus 100 Merits. Merits are used to level up through the Echelons (Ranks), from Echelon 1 to the max Echelon, which is level 80 in Blackout. As you move through the Echelons your title changes from Ranger (Echelon 1-19) to Frogman (Echelon 20-39), Airborne (Echelon 41-60), Seal (Echelon 61-79) and finally Battle Hardened (Echelon 80). Dark Ops Challenges are revealed as you complete them so we’ll update this page as we find them. Open the Blast Doors: Head to the Fracking Tower and go between the two cylindrical towers in the middle of the location. The two towers are connected by a bridge. In the middle, there’s a button to open the blast doors – push it. Zombie Jams: Head to the diner to the West of Array and play the jukebox. Red Light, Green Light: Head to the Cargo Dock and loot an underwater stash. You can find the stashes at either end of the ship – their location is marked by buoys. Baller: Go to the estates and score a hoop with a basketball. Back in the Ground: Murder 100 zombies. Fist Fighter: Punch someone to death. Practice Makes Perfect: Go to Firing Range and score a bullseye on a target from at least 90 meters away. Obviously, these ones are for vanilla multiplayer, but we’ve popped them in here in case you were looking for these. Shrug it off: Survive a direct hit from an RC-XD and kill the driver without dying. Mega Killer: Get 6 rapid kills. Frenzy Killer: Get 5 rapid kills. Get Outta Here: If an enemy uses the Grapple Gun and follows it up with a Grav Slam, kill them while they’re still in the air, before they can hit the ground with the skill. Nuked out: Earn a Nuclear medal in FFA without using scorestreak rewards. Fire with Fire: Kill an enemy that is using the Purifier with a Molotov. Nuclear Killer: Earn 30 Kills without dying. Brutal Killer: Earn 25 Kills without dying. Chain Killer: Get seven rapid kills. From the Depths: Get 25 kills against enemies that are on land when you are shooting at them from underwater. For more tips and tricks head over to our Black Ops 4 guide page.